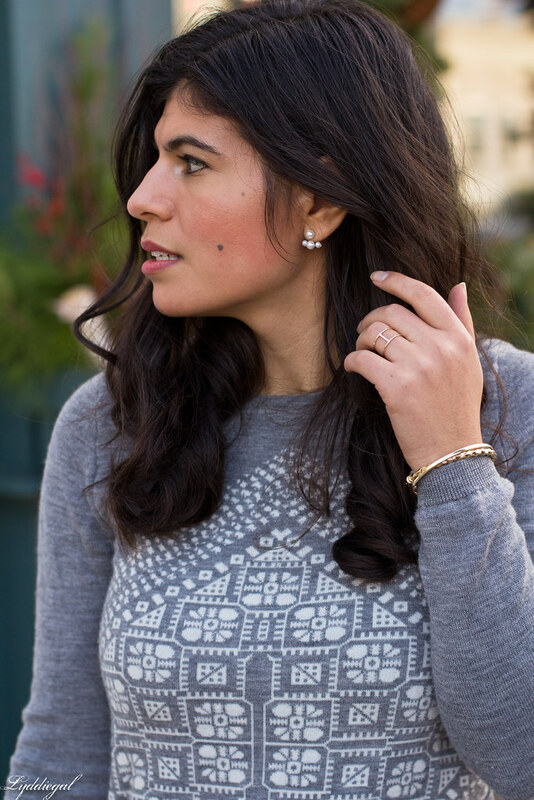 Today marks the first day of winter, and I'm sharing a decidedly un-wintery look. Taking advantage of the mild weather any chance I get, and donning my over the knee boots with a skirt. While today might be the shortest day of the year, I always take comfort in knowing that starting tomorrow they will be getting longer again, and as impossible as it may seem, we are now only six months from summer. While I'm not trying to rush things, I'm not exactly looking forward to the average temperatures of January and February. At least we are getting a grace period with temperatures in the fifties, for a little while longer, anyway. I love this outfit! I love the idea that the days are getting longer from here. Thank goodness! I certainly am not looking forward to cutting wind and ice, but I sure would welcome some colder temps and snow in St Louis. ☃ You look so adorable and winter ready! Merry Christmas! Very pretty Lydia, great earrings too ! In my case, well, you know that for us summer is beginning. I cannot tell you how hot its been, but it is said that it will be one of the hottest summers. So, I am not looking forward to it. Aw yes . . . Winter. Well like you said, it's all uphill from here as far as length of days and rising temps. My mother in law, worse at surprises than I am, already told me that she got me grey over the knee boots for Christmas and I cannot wait to open them and wear them! Merry Christmas Lydia! OTK boots and skirts is one of my favorite combinations. 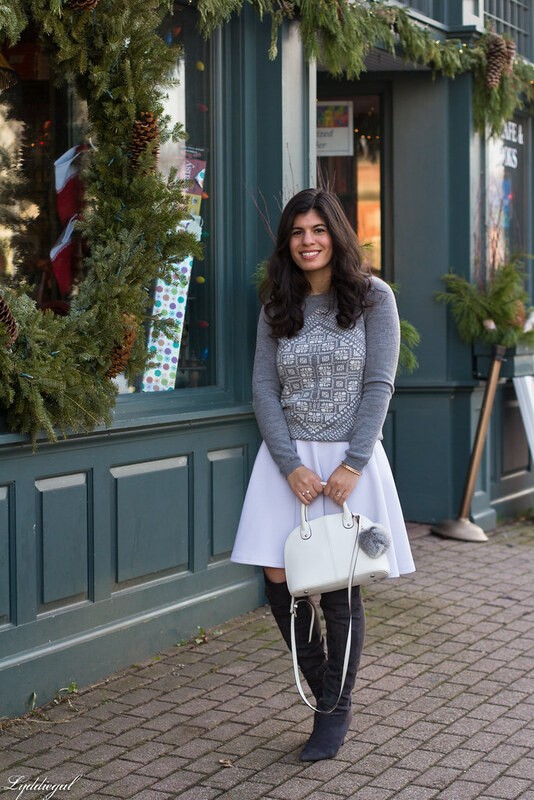 I love the fuller light colored skater skirt with your greys. I'm trying to take advantage of the warmer days too! thank goodness the days are getting longer! i love your boots and that fur pom is the cutest! I think the colors give a very wintery feel though! I would love to have 50 degree temps! It's in the 70s in Georgia today! Great colors here! Loving those boots and earrings! Still need to get my hands on some OTK boots. I agree, take advantage of those no-tights days while you have them! I love the soft, pretty grays in this look! Such a fun look! I love the bright white with the gray! I LOVE these no-tights days! The absolute best and I don't have an extra layer to add bulk either! Thank you so much for the card, it's gorgeous! It arrived this week! :) Perfect timing! I'm glad you're still having some warm weather (especially when it results in more opportunities for you to wear those awesome boots!). love the sweater and the skirt, such a nice look! 6 months away from Summer but who is counting? I have always always loved this gray sweatshirt with the snowflakes. It is perfect for this time of the year. 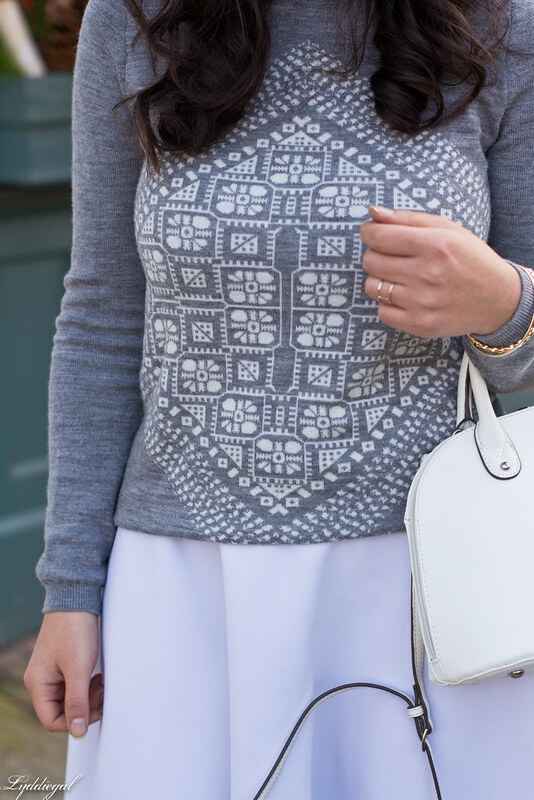 Gray and white are perfect for Winter. 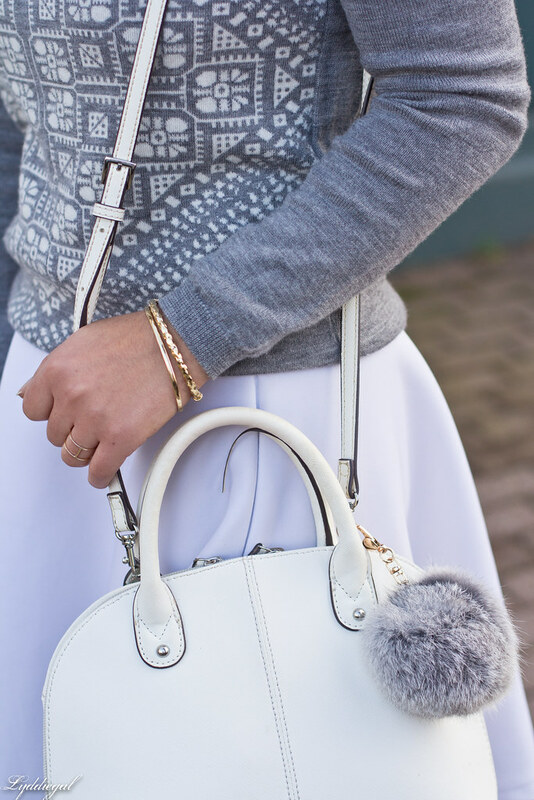 Love your bag and the matchy gray pom is perfect for the sweatshirt, too. Love your outfit! It's super cute!